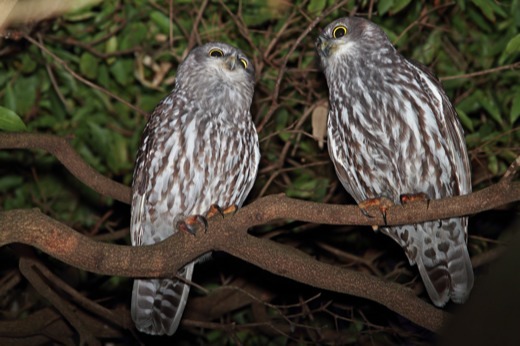 The Barking Owl is one of the rarest nocturnal birds in the state, but north-east Victoria is known to support several breeding pairs. A number of these occur in the Ovens-King River valleys, including around Wangaratta. Barking Owls prefer to creekline and riverine vegetation, primarily River Red Gum woodland where there are patches of dense wattle understorey for daytime roosting. They require large old hollow-bearing trees, not only to provide themselves with nesting sites but also to support potential prey items such as gliders, bats and small possums. They also consume a variety of birds and have a habit of hunting early in the evening shortly after day birds go to roost. They are very aptly named owl – their main contact call being a double syllable “wook-wook” which very much resembles the bark of a dog. They also occasionally give a trembling scream likened to a distressed woman, hence the birds other name of the Screaming Woman Owl.